In 1972, One Family began life as Cherish. In that year, a group of single mothers, led by Maura O’Dea Richards, set about reaching others in the same situation. Mary Robinson, then a Senator, became our first President. Founder member Colette O’Neill suggested Cherish as a name for the group, taken from the 1916 Proclamation which declared that Ireland would ‘cherish all of the children of the nation equally’. Unfortunately in 1972, this was not the case. Single pregnant women were often thrown out of their homes, lost their jobs and were rejected by their communities. It was extremely difficult for them to keep and raise their children themselves. Cherish was set up to provide such women and children with a voice, empowering women to help themselves and their families. As an organisation, Cherish not only provided services to single parents and their children, but also campaigned for change. While many changes were brought about, two of the most significant were the introduction of the unmarried mother’s allowance and the abolition of the status of illegitimacy. 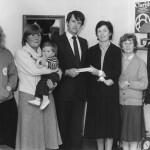 1973 In 1973, after much hard lobbying work, Cherish celebrated the introduction of the unmarried mother’s allowance – the first social welfare payment to acknowledge the existence of women bringing up children on their own. It was £8.50 per week. 1987 In 1987, after many years of campaigning, the Status of Children Act finally abolished the status of illegitimacy. 1990 Mary Robinson resigned as President of Cherish when she was elected President of Ireland, Ireland’s first female President. Senator Mary Henry became the next President of Cherish. 1997 We celebrated our 25th anniversary with our President Mary Henry and previous President Mary Robinson who congratulated Cherish on its sustainability and the quality of its services. 2003 When developing our Strategic Plan for 2004–06, it became clear that society was very different and that one-parent families now existed in many forms in Ireland. In recognition of these changes, we extended our services to all members of all one-parent families and renamed ourselves One Family. 2009 One Family merged with Gingerbread Ireland and assumed operational responsibility for Gingerbread. 2011 Our first Family Day event was held in the Iveagh Gardens, Dublin 2 with over 2,500 people gathering for a day of festivities in celebration of family diversity. 2012 Our founders, previous staff, current staff, Board members, past and current clients, social commentators, journalists and many others gathered to celebrate our 40th anniversary in an inspiring event which reflected on our past while looking to the future. 2013 Our Family Day Festival, going from strength to strength, was a record breaking event with 10,000 people in attendance on Sunday 19th May. 2016 Taking place in Wolfe Tone Square in Dublin 1, on 15th May, Family Day Festival provided all children with the opportunity to celebrate their family by drawing their family on our specially created One Family, Family Tree. This tree now proudly stands in Cherish House. 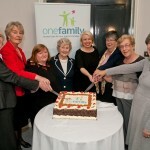 2017 One Family celebrated its 45th anniversary in 2017. We also said farewell to Cherish House. To enable us to provide services to more clients in a building that meets their needs, we moved to a newer building in Smithfield. We took all of the memories of Cherish House with us as we supported many more families to create happier futures. Today We continue to work to affect positive change and achieve equality and social inclusion for all one-parent families in Ireland. We look forward to many more years of achievement for our leading and radical organisation. You can read and/or download our current Strategy 2016-2018 here, and we invite you to get involved. Together with a small group of women, Maura founded One Family (formerly Cherish) in 1972 because she was a single unmarried mother who decided she wanted to keep and raise her child herself. 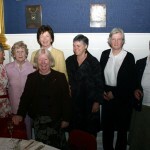 With the help of compassionate friends such as the then Senator Mary Robinson, their little group blossomed and became a major force for change in our society. Maura’s moving, funny and challenging memoir, Single Issue, is available on Amazon with proceeds contributing towards our work.